Reversing Cameras - What You Need To Know. Reversing cameras which are suitable for automotive use are simply CCTV (Closed Circuit Television) cameras which are of a size and shape to fit unobtrusively in place on motor vehicles. Although there are many stand alone systems which can be fitted, linking a reversing camera to your carputer is not only cheaper, it also opens up the possibility of recording live images to your carputer's hard drive. Potentially, this video evidence could be passed to your insurance company in the event of an accident. The resolution of a CCTV system determines the level of detail which can be seen on the picture. This is a function of camera and monitor. A poor quality camera will give a poor picture no matter how good the monitor. Similarly, a poor quality monitor will not display all the detail captured by a high quality camera. Camera Resolution is measured in pixels (Picture Elements). The higher the number of pixels, the higher the resolution of which the camera is capable. As a rough guide for a camera with a 4:3 aspect ratio, dividing the total number of pixels by 1000 will give the number of lines of horizontal resolution. e.g. a camera with 350,000 pixels would give 350 lines of horizontal resolution. The more lines of horizontal resolution, the better the image. Realistically you should aim for a minimum of 350 lines of resolution. However, if you can source a reversing camera with 400 or 500 lines at a reasonable price, this will give a much better image. Vertical resolution is seldom quoted for cameras, as it is a function of the signal standard. The two main TV signal standards are PAL and NTSC. PAL is the system commonly used in Europe, whilst NTSC is the system used in North and Central America. Many cameras will work with both systems. Most modern monitors and TV's will work with both systems. Ensure the combination of monitor and reversing camera you use are compatible with each other. It is generally better to choose a monitor which has a better resolution than that of the camera, to optimise the resolution of the system. Focus and Depth of Field. CCTV cameras normally have a fixed focus and field of view (i.e. they do not zoom). Having a fixed focus is not an issue as these CCTV's have a short focal length and a large depth of field. This ensures the subject remains in focus from infinity to a short distance from the lens. For a 1/4" sensor, 4mm or under, is considered wide angle, 6mm standard, and 8mm or over, telephoto. For a rear view camera, aim for a focal length of 2mm or less. The key component in this type of camera is the sensor. The sensor will either be a CMOS (Complementary Metal-Oxide Semiconductor) type, or a CCD (Charge Coupled Device) type. CMOS cameras are cheaper. CCD cameras give clearer higher resolution images. For this reason, unless you are on a tight budget, go for a CCD camera. The sensor has hundreds of thousands of individual pixels in a rectangular grid on a tiny chip measuring only 1/2", 1/3", or 1/4". Each pixel reacts to light by storing a small electric charge. The pixel signals are transfered to the camera's video processing circuitry 60 times per second NTSC) or 50 times per second (PAL). Sensor size is an important factor in determining image quality. The larger the size, the higher the quality. 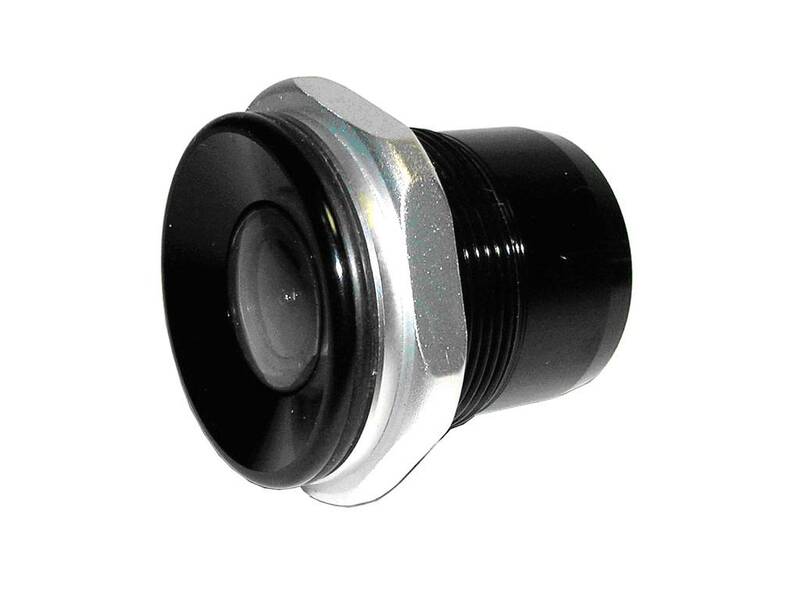 Whilst the 1/3" sensor is the most common one for mainstream video applications, most of the cameras currently available which are suitable for rear view use, have 1/4" sensors. A good Black & White camera will give an acceptable image in full moonlight. If it is sensitive enough to give an image in moonlight, a colour camera will only yield a Black & White image, unless there is additional artificial light. Click HERE to see typical LUX values for different lighting conditions. Make sure you get a car video camera which is able to generate a mirror image. This has the same orientation as the view obtained looking in your rear view mirror. Fitting Guide. A generic guide to fitting a reversing camera in your own car. Make sure you reverse safely. You can't be too careful - especially when there are kids around. Keep your insurance claims and premiums low by avoiding that sickening crunch.